On July 20, 2013 early morning, Rhitu Kumbang and I set out in a car to the National Highway (NH) 52 from Annapur village of Misamora. Rhitu's plan was to dropped me to the highway to get me passenger vehicle to my home village. The weather was pleasant with no sun rise in the morning, so he offered to take a drive along in the beautiful highway upon reaching Simenchapori. While driving, I asked him what was the plan for the day where he replied there was no such specific plan as paddy transplanting was almost over in their family. So, my mind just played the idea that whether we should tour to Sadiya. Both of us had never been to there. "Why not we take the car to there?" Rhitu exclaimed. But we did not had sufficient bucks. I countered how could he be so sure of driving the car to Sadiya since we did not had the knowledge of road condition. "Have not you listen oi nitom mentioning about Sumo-Winger vehicles plying to Amarpur, Sadiya? " Sadiya is a historically significant place. 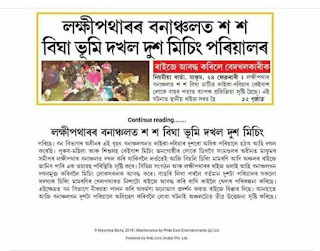 From the chronicles, we come across in where Miri (Mising) tribe had raided and attacked in the territroy of Ahom kingdom till seventeenth century. With the advent of the British after Yandaboo Treaty, 1826, Sadiya had become a place of seeds of Tani languages and literature. British and American Missionaries left the place with indelible mark among the present Adi and Mising people. J.H. Lorrain's " A Dictionary of Abor-Miri Language" (1906) is the earliest ever lexicography produced in those times in Tani language. Other contributions includes J.F Needham's "An Outline Grammar of Shaiyang Miri Language" (1866), collection of folk story in Padam clan language. And in modern times, because of the inaccessible surface communication Sadiya was a safe haven of insurgent outfits where cadres moved around freely in island villages. Even red rebels are gaining ground as the media of late has reported. Many things were heard, never seen. With all these exciting impressions in mind we plan to see the tip of Mising habitat, immortalized in many well-known folk songs in Mising society. We passed via the proposed Jonai campus Tezpur University in Majulipur village and reached our home. Rhitu and I had light breakfast given by Mom. Then we drove to Jonai to meet Bhisma Doley, once a senior who now works in a college. We exchanged our car with his bike. We filled few litres of petrol at Ruksin and moved towards Pasighat. Rhitu clean shaved and cut his hair in a salon. I bought some chocolates and chips in the town. We moved towards Mebo. We passed the beautiful Raneghat bridge over Siang. The highway was very clean with green forest on either sides with absence of man and vehicles. We crossed the famous knee-deep beautiful Siku river immortalized in oi ni:tom. Then the adventurous journey begun! No village, no people, only thick forest! We rode along the unknown small metalled road with scary mind imagining of wild animals and robbers with sword! There are few villages in between Mebo and Gadum namely Ngopok, Serum, Borguli, Namsing. And again, the imagery about these places is drawn only from one source--Oi ni:tom! We sung in the top of our voices with beating heart in the jungle road. We passed small wooden and iron bridges over streams and rivers. We passed the Serum korong (literal meaning for river in Adi and Mising). We drank water of the river and also had a face-wash with cream. People generally speaks Adi language here, which is very much intelligible to Mising except the variation in tone. On the hut shades in the river bank, we saw a retiring middle-aged couple while listening to melodious old oi ni:tom of Kunjalata Kaman. When they came to know that we were from Jonai, the avid oi nitom listeners curiously wanted to verify a rumor from us, " Heard Tongki had gone mad, is it true?" (Tongki bi simad kang emna tattungai, arroi?). We smiled and told them that we did not know about it that we too stay in Guwahati although we belongs to Jonai. We saw a group of damsels carrying a rifle most probably on their way to farm at Borguli. Rhitu and I did not dare to stare these damsels! There are repaired wooden bridges. Local people who look after the bridges charges Rs. 20/ 30 from travellers with vehicles. The road where there are villages are stained with cow dung. Males are generally seen wielding dao as it happens to be a forest area. There is a ghat after crossing Namsing. It is known as Taro-Tamak. We saw an old and long incomplete iron bridge stained with rust. We reached Gadum Tiniali nearly at 1 pm. We looked for tea shop and found one where we ate puris as we were hungry served by a Gorkha woman. We asked a couple on bike on how to reach Dotung ghat. People here generally tells travellers "Inde" (meaning there) when asked about distance to a place letting you presumed that it's in a stone's throw distance! Actually, it is not the case exactly, may I provide you with a tip---it's not less than 5 km! Gadum is a place with vast arable land with thin habitation. One would see stilted Mising houses with thatch roof in the country-sides in pictureque green background. We rode down from metalled road of Gadum to reach Amarpur. You have to passed through chapori in muddy road. If you are lucky, you come across vehicles in the forest coming from Roing that passes via Dibang and Dotung ghats. Of course, there are cattle-grazers and cowsheds which is true of every chapori. We crossed the Dotung ghat in country boat managed by local villagers. We went first to the famous Kedan Baazar where a weekly market is seated every Sunday. The bike was puncture just after crossing the Dotung ghat. It took almost two hours to find the small nail stuck in the back wheel by the mechanic and fix it back. This place of Amarpur came to prominence when the Takam Mising Porin Kebang (TMPK) once organized their central committee conference in 2008. Amarpur is an island and falls in Tinsukia district of Assam. The northern side across the river falls in Lower Dibang Valley district of Arunachal. The region of Assam is called Sadiya. It is said that there is no proper demarcation of boundary between Assam and Arunachal here. Land entitlements and permanent residence certificates keep worrying the minds of the people. Both sides are inhabited by Mising people. It was a sun set hour. We passed village after village in this unknown and new place to reach to a house we were looking for. When we reached, we came to know the person was not at home. We knew only one person in this unknown place, that too was not there! Rhitu was red-faced and I was speechless, we rode back via the muddy road and sat in an intersection thinking of where to proceed. In the twilight, we were left in a situation of --No Where To Go! To back to Jonai, there is the fierce jungle road. To reach the Chapakhowa town, we did not know the distance and possibility of getting ferry was thin! All our adventurous journey ended up in smoke! However, we managed to refuge ourselves in an stranger's house near a lower primary school in the night!